Locusts are a type of insect from the family Acrididae and also are known as grasshoppers. Locusts swarm in huge numbers and can travel great distances, causing considerable damage to crops. However, in many African, Middle Eastern and Asian countries, locusts are considered a delicacy and eaten in abundance. Locusts are an excellent source of protein and contain a variety of fatty acids and minerals. Although not considered palatable by most Americans, locusts are an important food source in many other countries. Locusts are actually the swarming phase of short-horned grasshoppers, which breed rapidly and become very social and migratory. As adults, locusts form swarms consisting of millions of insects, which can rapidly strip fields and greatly damage food crops. The origin of locusts is unclear, but ancient texts, including the Bible, mention them and their destructive abilities. Locusts are one of many species of insect considered edible, and they are prepared in numerous ways, ranging from dried to smoked to fried. Locusts, like many insects, are an excellent source of protein. According to the book “Insects” by Steve Parker, species of locusts vary in protein content from about 50 percent of dry weight to almost 60 percent, making them denser in protein than cows. However, the protein of some species of locust is not considered complete because it is missing the essential amino acid methionine, which cannot be made by human beings. Overall, the protein nutritional value of locust is considered inferior to casein, which is the primary protein of dairy products. The percentage of fat in desert locusts is lower than their percentage of protein, but still a reasonable source, at almost 12 percent, according to a 2001 edition of the “Journal of King Saud University.” The percentages of saturated and unsaturated fatty acids are 44 percent and 54 percent, respectively. Palmiteic, oleic and linolenic acids are the most abundant fatty acids. However, the researchers noted that the cholesterol content in locusts is high, about 286 milligrams per 100 grams, which is higher than that found in meat or poultry. 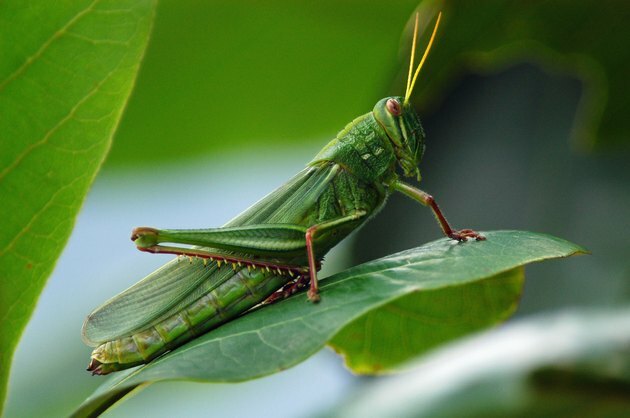 Locusts also contain adequate amounts of iodine, phosphorus, iron, thiamine, riboflavin, niacin, as well as traces of calcium, magnesium and selenium. Carbohydrate levels are very low in locusts, which makes them a good candidate for Atkins and Paleo types of diets. Some people describe cooked locust as similar to smoky flavored bacon and reasonably tasty. Exercise caution if you are in a foreign country and willing to try locusts, as their sanitary practices are seldom to the standards of the United States. Journal of King Saud University; Desert Locust (Schistocerca gregaria): Proximate Composition, Physiochemical Characteristics of Lipids, Fatty Acids and Cholesterol Contents and Nutritional Value of Protein; Hamza M. Abu-Tarboush et al. How Many Calories Does a Doner Kebab Have?